The great liners often called into Queenstown (now Cobh) Cork on their way between Europe and the USA after calling onto French ports (Cherbourg and Le Harve). Brittany Ferries picked up on this in 1978 when they announced they were starting a service between Roscoff and Cork. The ship used would be the Armorique which was to leave Roscoff on Friday night, arrive in Cork at about mid day and leave at 15.00 for an early Sunday arrival in Roscoff. The Armorique was to do a twice-weekly service between Santander and Plymouth also was announced. 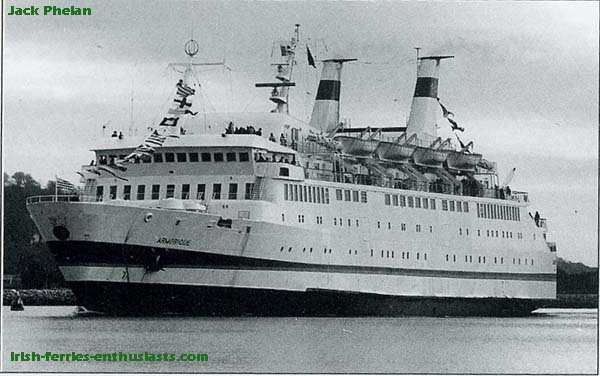 The Armorique made a special trip to Cork for St. Patrickâ€™s Day 1978(March 17th). She docked at South Customs House Quay for the day and the Bretons that travelled over took part in the St. Patrickâ€™s Day parade. Corkonians visited the arrival and marvelled at how different and â€œFrenchâ€ she was. The Pen ar Bed also made a special visit on May 4th 1978. The weekly service commenced on May 27th 1978. The Armorique used The Tivoli Ferry port for her first year sailings with the Pen ar Bed taking the end of season sailings. In 1979 the Normandia was announced to come and cover the truck and trailer traffic leaving the Armorique free for holidaying motorists. A surprise visitor to Cork on March 3rd 1979 was the Prince of Brittany. The regular vessel was unable to come and the Prince was sent to cover. It was her first visit and her next would be in very different circumstances. 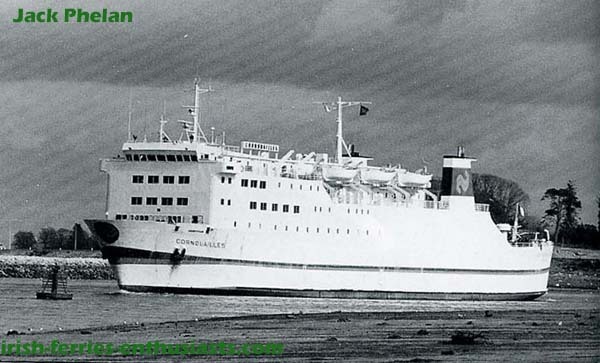 On March 31st 1979 the Cornouailles arrived at Tivoli from Roscoff. The Cornouailles replaced the Pen ar Bed for the autumn sailings to Cork as bookings were heavier than expected. The Cornouailles opened the 1980 season while the Armorique had charge of the high season sailings. Infact volume grew so much that in the space of 3 years the ships were too small to handle the number of lorries and private cars using the service and a freight ship the Brizh Izel was also used. The service had proven those â€œin the know whoâ€ thought the service would never be viable wrong, within 2 years 2 ships provided a weekly service. The Pen ar Bed was used to commence the 1981 timetable with the Armnorique also continuing to operate between Cork and Roscoff while early bookings for cars and freight continued to grow steadily. Brittany Ferries announced in â€™81 that the newly charted Tregor would be starting a new service to Dun Laoighaire. The Tregorâ€™s charter fell through at the last minute (the company claimed that the charter could not be finalised in time for the 1981 season) and so did the Dun Laoighaire service (P&O Irish Sea started it in 2002). 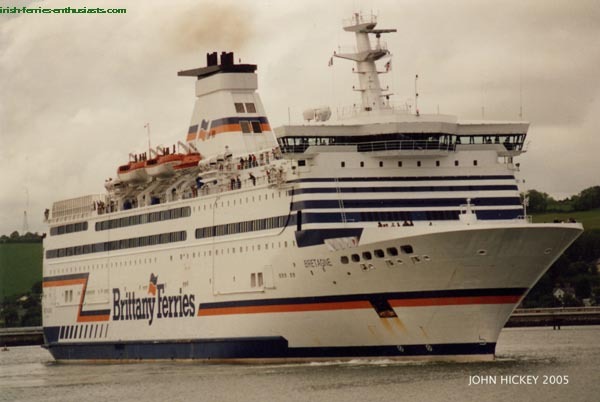 The Brizh Izel did not come in 1981, but ran to Rosslare on an integrated Irish Continental Line/ Brittany Ferries freight service. The Goelo made her one and only visit in March. There were big changes in 1982. Brittany Ferries announced the charter of the Nils Dacke, renamed her the Quieberon and put her on the Cork and Santander routes. Her speed was much superior to that of the Armorique and she had an increased capacity for vehicles and passengers. The Quieberon never served Tivoli as Brittany Ferries were happy to Cork Harbour Commissionersâ€™ new ferry port at Ringaskiddy. The ship established new standards on ferries to Ireland. In October the Prince of Brittany arrived back at Cork. She was cruising from Normandy and berthed at the North Custom House Quay. She departed with her cruising clientele to Swansea (, reviving memories of B&I Lineâ€™s abandoned service. In 1984 there was little change, the Quiberon worked the routes as usual. In 1984 the Benodet made her first call to Ringaskiddy on May 5th. The Quiberon still ran to Santander and Plymouth during and on Friday nights left Roscoff for Cork, returning on Saturday afternoons for the convent early morning arrival on Sundays in Roscoff. 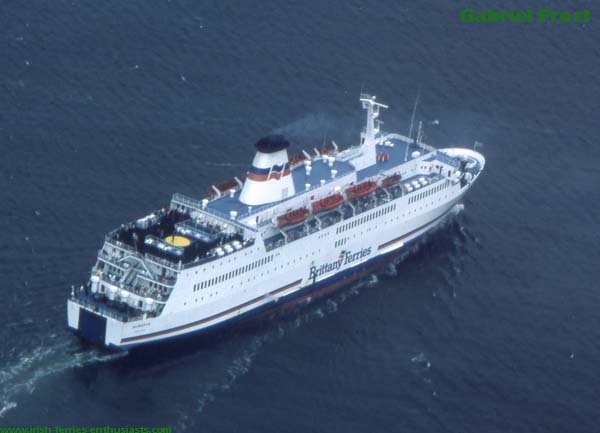 On may 23rd, 1985 the Armorique returned to Ringaskiddy and in the autumn, Brittany Ferries sent the Tregastel to Cork. A fire on board the Quiberon marred her in the early part of 1986. Although it did little damage, a crew member died and, following repairs the Quiberon returned as before. In 1987 a new company, Swansea Cork Ferries, had revived the ferry service between the two cities. Brittany Ferries helped enormously in setting up the new company including organising and setting up (even handleing) bookings and office procedures. Brittany Ferries decided that they needed extra space and they came to a chartering arrangement with Swansea Cork Ferries. 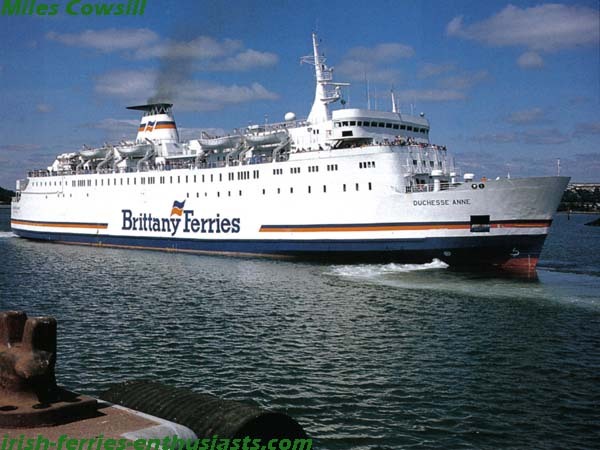 As a result the Polish registered Celtic Pride commenced mid-week sailings for Brittany Ferries. 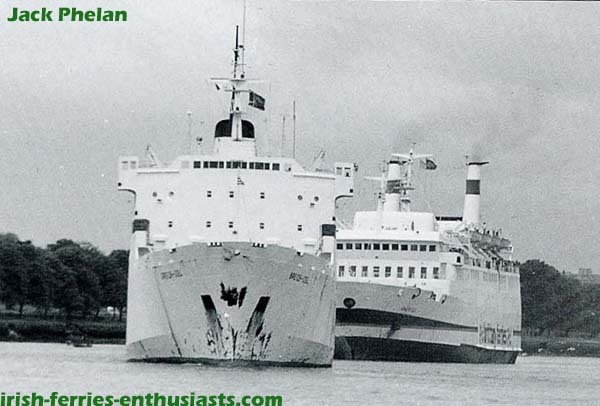 These additional sailings were during the high season, so the Quiberon and the Celtic Pride in tandem (it is believed to be the first time that Roscoff was served by a non French crew). The Cornouailles also returned to Cork on March 23rd 1987, in the colours of Truckline (the freight company acquired by Brittany Ferries). The 1988 season had the Quiebron at weekends and the Celtic Pride midweek in high season. The usage was good and there were talks of a bigger ship, the Bretagne. It was hoped that it would be ready for the start of high seasion in 1989 but delays in fitting-out meant that Cork was again host to the Quiberon. There was no midweek sailing in 1989 as the Celtic Pride returned to Poland. The Bretagne finally arrived and took over in the latter half of 1989. BAI had commenced Cork sailings in 1978 with the Armorique- â€œtoo bigâ€ (according to travel critics), 11 years the Quiebron-â€œmuch too bigâ€ and the Bretange in â€™89 (what did they say about that?) with space for 2,030 passangers, 580 cars and 580 cabins. 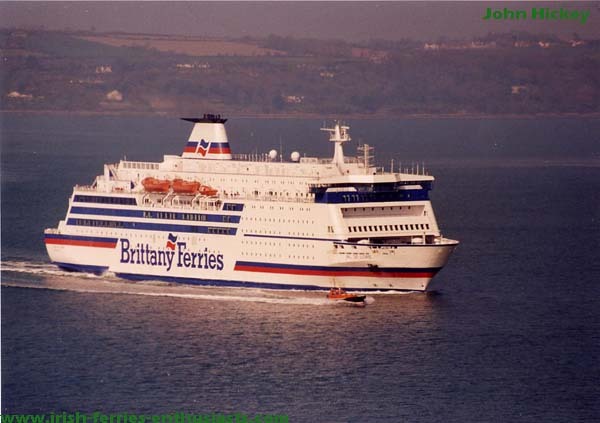 The 1991 season was started with the Swansea Corkâ€™s Celtic Pride commencing the weekend service for Brittany Ferries. The familiar slot was now being run by an Irish operated, Polish owned ship with the Polish/Irish crew being firm favourites ashore in Roscoff. Then came the Bretagne for her third summer season. In September the Celtic Pride returned to Roscoff at weekends. 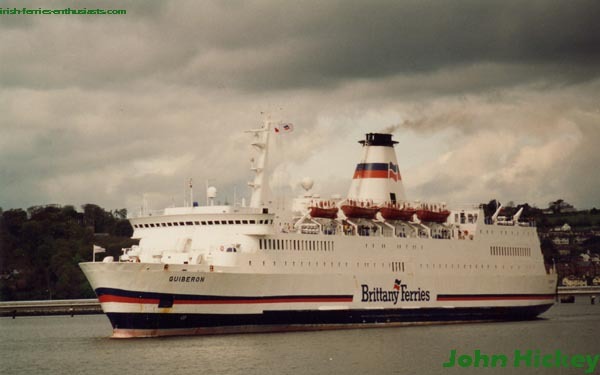 Brittany Ferries felt that the increase in traffic in 1991 ment that they should operate all Cork-Roscoff services them selves, with their own ships. This is what they did in 1992. 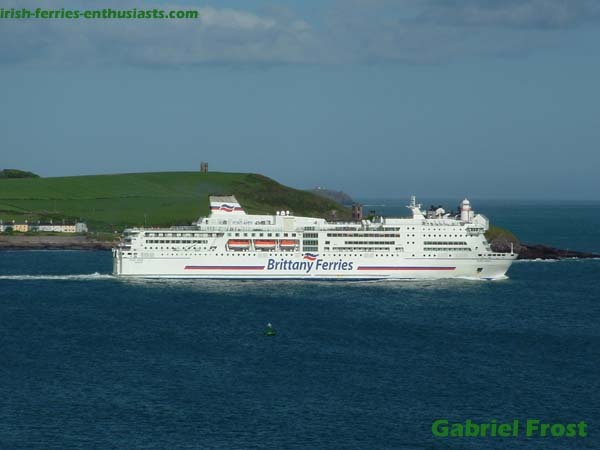 The Cornouailles returned to Cork, sailing as the Havelet of British Channel Island Ferries under charter to Brittany Ferries, however it was not a happy return. Following her late arrival, on her return to Roscoff her sailing was terminated when a freak wave struck the ship causing serious listing and damage to vehicles on the car decks. She came back to Cork for repairs and left on Monday, March 16th, causing a row with the Department of the Marine who claimed that their enquires were not complete. The next arrival of the â€™92 season was the first and only visit of the Duc de Normandie. The Quiebron then took over and the Bretagne arrived back for the high seasion. Roscoff-Cork voyage on June 12th. On June 20th the Duchesse Anne (B+Iâ€™s Connacht) was used to start a second service linking Cork to Roscoff and also a new Cork St. Malo link The company marked the return of one of Corkâ€™s old favourites with a reception to which they invited Capt. Seanus Sydenham, her former master and Mr Patrick Martin, her designer at Verolme. The Duchess Ann leaving Ringaskiddy. For 10 years the Val de Loire operated the Cork-Roscoff service with the Quiberon providing the opening season untill the mid 1990s. The facilities of the Val de Loire have been praised by all her passengers and she has been compared to a that of a cruse ship. In September 2000 the Val de Loire suffered severe problems with one of her propeller shafts overheating. When the problem was initially identified it was hoped that it could be repaired on site but it was soon realised that it was a serious that would require the ship to be taken out of service. As a result a sailing between Cork and Roscoff took more than 30hrs as she was forced to sail to Brest for repairs that took over two weeks, having originally been estimated at only one. During this time the fleet undertook the largest shake up for over a decade, with the Barfleur originally filling in, then the Bretagne. Her last Cork-Roscoff sailing was in September 2003. Brittany Ferries took deliverary of their new flag ship, the MV Pont Aven on Friday,27 of February 2004 and her first arrival in Cork shall be on April 3rd. She shall cut the journey by 3 hours and boasts facilities that no other car ferry has, an open deck swimming pool with retractable glass megadrome roof, wrap around promenade and a five deck high atrium with panoramic lifts as well as the usual shops and restaurants. The Pont-Aven had a difficult inaugural season however. She was withdrawn from service for two weeks in August, following an incident on the 11th when a seawater gate valve failed during a routine filter change while docked in Plymouth, resulting in one of the vessel’s auxiliary engine rooms filling rapidly with 1,200 tons of water. Emergency services were called, although the inflow was such that a UK MoD tug had to be employed to pump out the flooded space. Sailings were cancelled and the vessel sailed to Brest for emergency repairs, eventually returning to service on the 23rd August, albeit initially at reduced speed. In May 2006 she again made headlines, after being struck by a 20m freak wave, which crashed over her bow, smashing windows on its promenade deck and driving seawater into 150 cabins and connecting corridors and passage, and resulting in minor injuries to five passangers. The vessel was en-route to Santander, Spain, but diverted to Roscoff following the incident. She then sailed to Brest for repairs, including temporary covering of the forward promenade deck windows and the replacement of carpet on decks 5 & 6.